Turkey Says “Hi!” – Hey, Look! A Writer Fellow! Good thing there is Tofu Alternative. 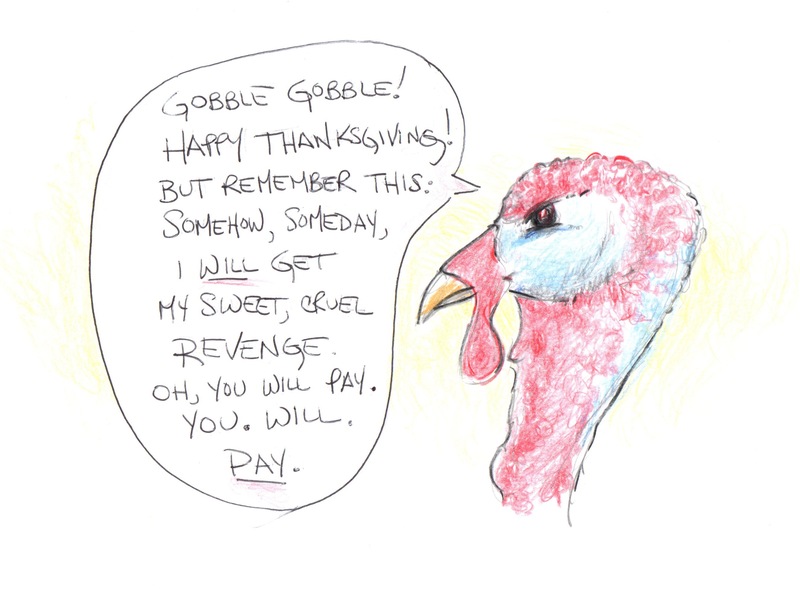 Revenge of the turkey is worth noting. I’d rather face turkey rage than eat tofu. Watch out. Turkeys are known outlaws and troublemakers. Why do you think that they receive a presidential pardon? Happy Thanksgiving, Mike. 🙂 Enjoy the turkey! Have a marvelous feast, Aunt Elaine! Have a wonderful Thanksgiving, Mike. Maybe you should avoid the turkey. Sometimes eating turkey is a risk worth taking. Hey Turkey! I pffft in your general direction! And I’ll pfft right back atcha. I don’t blame Tom (turkey). Revenge is deserved. Last night my writing students wrote a story in the turkey’s POV, convincing Americans to never again eat turkey. Turkey karma is not a good thing! Happy Thanksgiving, Mike! Well that’s not frightening at all! Happy Thanksgiving, Mike! Don’t tell me you tofu-ed your turkey.